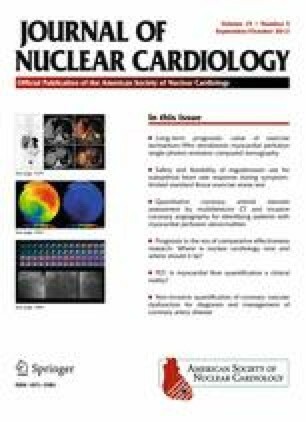 Prognosis in the era of comparative effectiveness research: Where is nuclear cardiology now and where should it be? Since our last review of the prognostic accuracy of stress myocardial perfusion SPECT, 1 numerous advances in the field have promulgated tremendous (and oft characterized as excessive) growth in the utilization of nuclear cardiology services over the past few decades. 2- 4 The overall procedural utilization for stress myocardial perfusion imaging (MPI) reached its height in ~2008 with over 10 million procedures performed and Medicare expenditures in excess of $1 billion. 3 Although many have focused culpability for growth on high reimbursement levels, the published evidence base also figured prominently in supporting healthcare coverage decisions and promoting utilization. Figure 1 plots the relationship between publications on nuclear cardiology and Medicare payments to physicians for stress MPI. An erratum to this article can be found at http://dx.doi.org/10.1007/s12350-012-9605-y. http://www.commonwealthfund.org/Publications/Fund-Reports/2007/Jan/Slowing-the-Growth-of-U-S-Health-Care-Expenditures-What-Are-the-Options.aspx. Accessed May 10 2012.
www.cms.gov/DataCompendium/. Accessed May 10 2012.
http://www.kaiseredu.org/Issue-Modules/US-Health-Care-Costs/Background-Brief.aspx#footnote5. Accessed May 10 2012. Knuuti J, Saraste A. Advances in clinical application of quantitative myocardial perfusion imaging. J Nucl Cardiol 2012. doi: 10.1007/s12350-012-9530-0. https://www.promisetrial.org. Accessed May 10 2012.
http://www.rescuetrial.org. Accessed May 10 2012.
https://www.ischemiatrial.org. Accessed May 10 2012.